My dear readers, I am going to be your hostess and present Melbourne to you as an exquisite 5 course dinner, which I am sure you will enjoy to the fullest. You have 2 options. You can have it a la carte ( Visit Melbourne-Tourism Victoria website) or table d'hote ( Come Alive in Melbourne videos ) ... with me. We have crunchy , tangy Pani Puri for starters. Melbournians' warm , joyous spirit is infectious. City is not just the art, architecture and infrastructure but also the citizens' culture. Melbornians are accommodating and possess large hearts. They mix up genuinely with foreigners, without any inhibitions. This is totally evident in the following video. 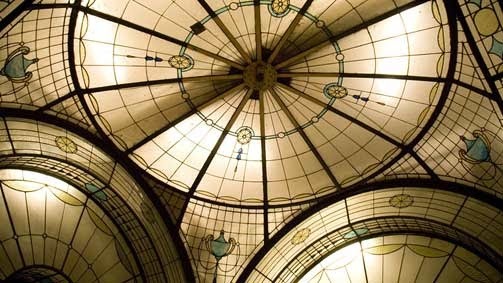 For the main-course we have richly rich history .Let's revel into the golden past of Melbourne, which is literally GOLD, with gold-mining history. Melbourne is founded by John Batman and John Pascoe Fawker. Governor Bourke named it Melbourne in 1837 after the then British Prime minister William Lamb, 2nd Viscount Melbourne. Gold was discovered in 1851 and the resulting gold rush transformed Melbourne. The accelerated population growth and the enormous wealth of the goldfield ushered in the era known as Marvellous Melbourne. Melbourne was the national capital of Australia from 1901 to 1927. 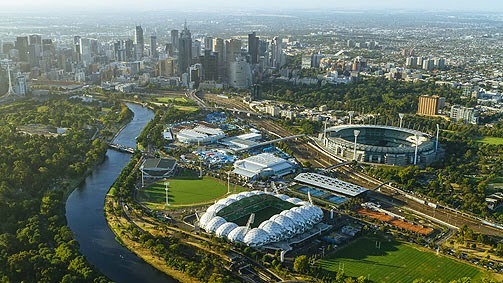 In 1956 Melbourne hosted The Olympics. In 2003 Melbourne was named as a UNESCO City of Literature. I am sure all of you enjoyed the historical main course. Now it's time for the present. Melbourne hosts the majority of Australia's contemporary festivals , thrilling world-class events, art-culture-music shows etc. Tourism is a major industry. Have a look at what makes Melbourne Australia's second largest city modern , commercial-financial center, cosmopolitan, elegant and chic ... the most livable as well as lovable city in the world. Next on the platter is ' Melbourne in 1 word - Awesome ' which consists variety entertainment for all in the family. Thrilling experience of the Great Ocean Walk, Melbourne Cricket Ground, different types of Australian wildlife, especially Penguin parade at Phillip Island, Cruising the streets of Melbourne and enjoying delicious meal in the Colonial Tram car restaurant, Hot air ballooning , Segway-rides, wonderful vineyards of Yarra valley, crossing the West Gate Bridge for amazing view of the Melbourne city. Finally it's the time for nutty , sweet desserts. Let's fall in love with Melbourne as Shantaram did with our Mumbai. *Shantaram is a blockbuster novel by a Melbourne-born author Gregory David Roberts. He got addicted to heroin when his marriage broke. He was a convicted bank robber who escaped from prison and fled to Mumbai, lived for ten years as a fugitive. He established a free medicine clinic for slum-dwellers. Simultaneously he worked as a counterfeiter, smuggler ,gunrunner, and street soldier for a branch of the Mumbai mafia. Recaptured in Germany, he served out his sentence there and in Australian prison. After his release, he established a successful multimedia company, and since the publication of Shantaram, he is a full-time writer. In 2003 G. D. Roberts wrote the novel 'Shantaram'. The novel is a smashing hit all over the world in general and Mumbai in particular for it's in your face portrayal of fast n furious life in Mumbai. The book's name Shantaram is derived from the name his best friend's mother gave him, which means "Man of Peace,". Shantaram loves Mumbai as his own so it's quite natural to reciprocate the love with Melbourne. Shantaram has literally given his blood and soul for Aamchi Mumbai. Do we have any other option but to fall head over hill, in Love with Melbourne? There is so much common between Mumbai and Melbourne. I wish Prime Minister Narendra Modi declares Melbourne as the sister city of Mumbai. It will promote cultural, commercial ties, foster friendship, understanding between different cultures, and will encourage trade as well as tourism. Which of these places would you want to visit in Melbourne and why ? Please answer in a comment box. Thank you all for participation. Heartiest Congratulations to D.Nambiar for winning the Melbourne Menu contest. Kindly inbox your contact details by tonight. Thank u so much Balaka. What a pleasant surprise. I am eager to visit Melbourne now. Cheers! Wow, tht looks like a perfect menu..
For the nature lover in me, I would love to visit Ballarat Wildlife Park n handfeed Kangaroos and Koalas. My little one would love to watch them in the wild..
Meghana , you are welcome to the Melbourne party with the lil Princess. Interesting as well as informative post Sujata. Tasty main course and platter with little bit history and some interesting stuffs. Enjoyed reading it completely. I love to see myself standing amidst a bunch of penguins, kissing and playing with them, at phillip island. Gowthama , Thanks 4 so many compliments and wishes. Cruxrebels , Thanks for your elaborate comment and wishes. Wish you a very happy and prosperous new year. Enjoyed reading the blog. Lovely pictures. Hello Ma'am, this is wonderfully written and I have already started craving to visit Melbourne! I want to visit MCG - Melbourne Cricket Ground, one obvious reason being I am a die hard Cricket fan and would want to explore MCG and be stunned with it. I would like to go for Main menu first and then have starters. But seriously I would love to Melbourne to street art...Hope both of us will definitely enjoy shopping at The Queen Victoria Market!!!! I hope you get to feast on Melbourne soon. Happy New year to you. If I were to visit Melbourne, the first thing on the to-do list would be that seaside drive. I can’t get enough of scenic drives and rock formations. Looks like if I do the Great Ocean drive, I’ll get to see the sea, drive along it and go see the Apostles and London Arch and Ginson Steps and Lock Ard Gorge and all that. So yeah, that is what I’d like to do most of all — The Great Ocean Drive. Very creative interpretation of the prompt. Of course its too late to participate in the contest so I won't. Good luck and Happy New Year. That was an awesome post. Felt the urge for visiting Melbourne. Thanks Manisha . Yes Let's go shopping at Vic market. Thanks kalpana . Happy & Prosperous new year to you. Thanks Ajay. Wish you get to visit Melbourne for the World Cup.